The number of people in California prisons doubled over the last 20 years, largely driven by mandatory sentencing policies such as “Three-Strikes Laws,” changes to parole, and high numbers of drug arrests. In fact, about 28,000 people are currently locked up in California prisons for drug offenses—the most serious offense for a third of these people is drug possession. A March 2011 poll by Lake Research Partners found that 72 percent of California voters support reducing the penalty for possession of a small amount of illegal drugs for personal use from a felony to a misdemeanor. Fifty-one percent believe that those caught with a small amount of drugs should spend fewer than 3 months (27 percent) or no time at all (24 percent) in jail. The current penalty in California for possession of heroin or cocaine is 16 months to 3 years in prison. 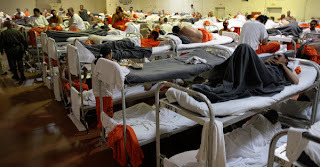 Another interesting fact from the California Department of Corrections and Rehabilitation is that about a quarter of all people in California prisons have no histories or record of violence. In other words, about 40,000 people sitting in California prisons have no history of violence—about the same number the court order is mandating be removed from state prisons. As of October 1, counties started accepting people from state prisons, but rather than choosing the option to move people to community-based services, a number of counties are using their increasing funds for adding jail capacity. This is a mistake. California cannot build its way out of a criminal justice problem, but it can find manageable ways to work with people and communities most affected by the justice system. Already, media is sharing doomsday reports of what will happen when and if people are released, especially when current statistics show that two out of every three people released from prison in California will return within three years. Most people won’t even be released under this plan, but rather moved to county jails to serve their sentence. Still, there is something California can and should do about its high recidivism rates. California can do more to support men and women coming out of prison—whether they are being supervised on parole or not—to make sure that they are getting what they need to be successful in the community, including jobs, housing and treatment, if needed. Changing the way we treat people coming out of prison can not only change the outcomes of people being released, but benefits public safety as well. Rather than fear-mongering about what will happen as California moves people from prison, we should be looking toward improving communities, not building more jail and prison facilities. Without sentencing reform to reduce penalties for a number of offenses—not just moving the location where people serve their sentences—and a reworking of parole and probation practices, in addition to establishing better reentry services in the community, the need for beds isn’t going to go away. It’s time for California to focus on long-term solutions for reducing prison populations and improving communities. Now that would be something to brag about. The only way to help reduce the number of prisoners in California is for the people to nurture the young generation with Godly family values.